Designer Charlotte Casade’jus has one of the world’s largest collections of antique French embroidered linens. In keeping with America’s birthday celebration, I thought this another fitting way to use our flag as a design element. 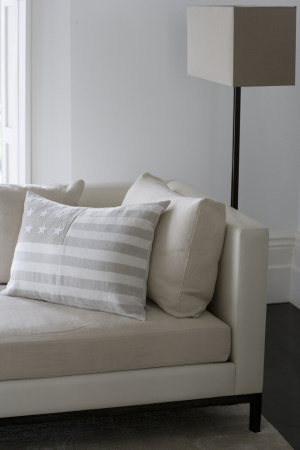 Isn’t this a beautiful American patchwork flag cushion? The designer has used neutral texture and tones from her vast collection of antique linens to create a wonderful collection of contemporary textiles.